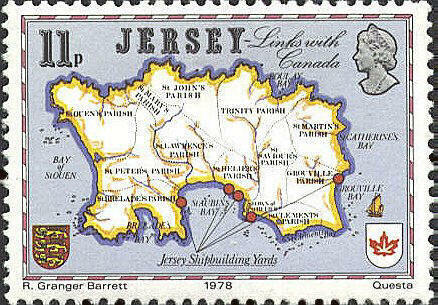 The map of this stamp issued by Jersey in 1978 was "adapted from a document with a dedicatory statement asserting that 'This map of the island of Jersey was by permission respectfully Inscribed by Wm Pless ... To His Excellency Major Hugh Mackay Gordon, Lieutenant Governor and Commander in Chief ... Jan. 1817." (Walter Klinefelter, "The Map from Pless Account of Jersey 1817," The Carto-Philatelist, vol. 25, no. 2, p. 11l) Most of the detail on the original map has been omitted while "Jersey Shipbuilding Yards" and the ship to the right of the island were added. Hugh Mackay Gordon began his career in 1775 as a volunteer in America and rose to the rank of Majaor General in 1811. He became Lieutenant Governor of Jersey in March 1816. In the lower left corner of the stamp ar the arms of England, gules three lions passant guardant" [background red, three lions viewed from the side facing left with heads turned toward the viewer].